American artiste, Childish Gambino on Sunday took home four Grammy awards, including the coveted Song of the Year for his politically charged ‘This Is America’ whose graphic music video carried a strong message on gun violence and racism. The trap gospel song packed with social commentary from Childish Gambino, the alter ego of actor and recording artist, Donald Glover beat fellow category heavyweights like Drake, Cardi B and Lady Gaga to nab the award. The striking video of the song racked up more than 35 million YouTube views in just two days last spring. 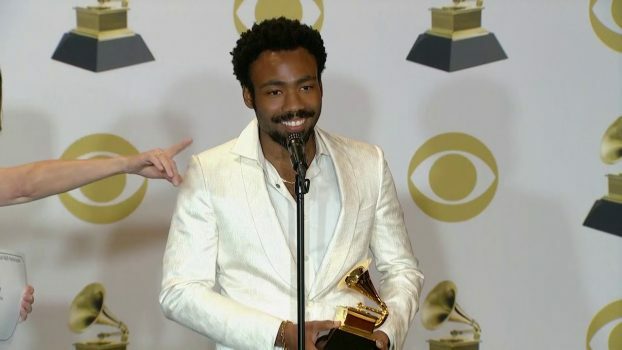 Gambino had earlier at the event clinched the Grammys for Best Music Video and Best Rap/Song Performance. Upon its release, the video of ‘This is America’ lit up social media with comments over its intense allusions to the oppression of black people and America’s all-too-common mass shootings. Although Glover was not in attendance at the awards held at the Staples Center, organizers said he had declined an invitation to perform at the event. The win is Gambino’s first in a major Grammy category and fourth overall after his hit ‘Redbone’ won the prize for Best Traditional R&B Performance in 2018. So far, the California-born performer has notched 12 career Grammy nominations.